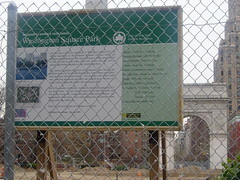 This Parks Department sign – “Working to Improve Your Park: Washington Square Park” – outlines some of New York City’s redesign plan and makes its appearance in numerous places throughout the Park. People stop and avidly read it because they can’t quite figure out what in the world is going on at Washington Square Park when they see the North West quadrant and main plaza – the Arch, the Fountain (well, where it once was) – gated off. It’s an excellent question. One not easily answered.